Adam West Is Getting An Action Figure. No, Not Batman. Adam West. I mean, I'm not complaining - it's not like there's a paucity of Batman merchandise, even Batman '66 these days. But still, not every actor can pull off the demand to get an action figure of themselves rather than a character they're playing. You do you, Adam West! Although it's not technically just straight up 'our' Adam West - it's based on the Blue Water comic series The Mis-Adventures Of Adam West, a completely true slightly embellished account of the escapades of the former caped crusader as he travels through time and space saving the universe. Wait, what? How did we not ever get an Adam West Bond? That would've been amazing. A sort of Roger Moore era sort of West Bond movie would be right up my street. 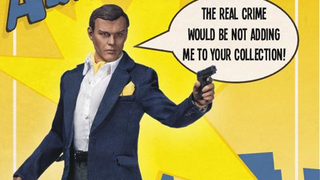 The Adam West figure will be out later this year, and will set you back an alarming $175. I love Adam West, but perhaps not that much.